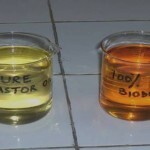 Researchers from Spain conducted an experiment to compare conventional an d ultrasound-assisted transesterification for the production of biodiesel from castoroil. The results showed that sonicated transesterification leads to higher castoroil methyl ester yield. The energy required along each type of transesterification was measured which showed that sonicated transesterification consumes lower amount of energy than conventional one.